I know I said I was trying to eat and feed my family more healthy, but how could I possibly have my first "come back" post a super healthy recipe?!? I decided to come back with a bang! 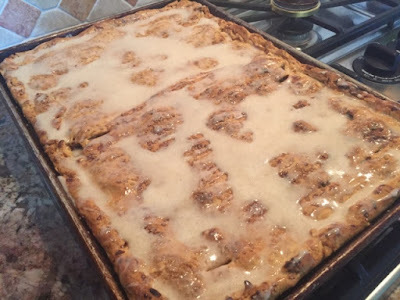 This Apple Slab Pie w/ Apple Cider Glaze was just the recipe I needed! First, it is fall so Apple pie is a must. This is not just any Apple pie...this is a slab pie! A slab pie is meant to be made when you need to feed a crowd...a hungry crowd that is!! I made this for my families October birthday celebration. It was a hit! Want to know how I know this? My mom ate two pieces...and not within a few hours of each other, I am talking back to back pieces! You will notice I don't have a recipe for the double crust. There is a reason...I usually don't make my own crust. There are things I love to take the time to make from scratch, but pie crust is not one of them. It is such a time saver to grab a crust or two from the store. I did however take the time to set up my Pampered Chef Apple Corer and Peeler I received as a gift from my mother in law. It took some cursing and a bit of frustration, but once it was together it was a blast to peel, core and thinly slice my apples all in one fell swoop! Hey it does not take much to make this girl happy!!! What does make me happy is this slab pie. Please take the extra step and save the apple cinnamon juicy goodness that will be drained from the apple filling. When mixed in with the other ingredients it makes the perfect glaze for this yummy pie!!! - 1/4 c. Heavy cream (for brushing top of crust pre-baked). 1. Preheat oven to 375 degrees or 350 degrees if using a convection oven. covered and coming over sides by about an inch or two. aside for about 10 minutes so that excess apple juice will drain. waiting to be filled in jelly roll pan. 7. Scoop out apples and place over the uncooked pie crust in jelly roll. 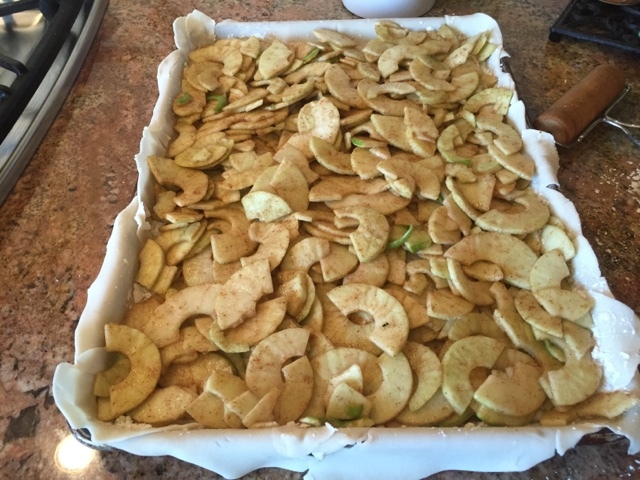 Make a nice even layer so apples cook evenly. not have to be picture perfect as long as it covers the top of the pie. with fingers or a fork so edges are seamed together. escape. Sprinkle with course sugar. 14. Serve with a scoop of vanilla ice-cream.